This is the polygonal garden just inside the entrance gate, on the northern side of the main driveway. 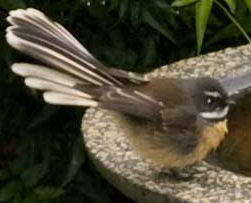 It is also the first stop in the "time travel" walk, if you are travelling from Taiwan 5,000 years ago to twelfth-century Aotearoa (or the last, if you are voyaging from the present into the remote past). 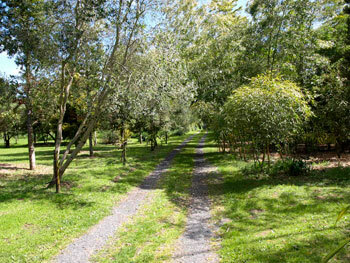 This sector is bounded by the trees planted along the northern half of the road frontage and the adjoining grassed area to the east and north, and by the moso bamboo grove to the west. 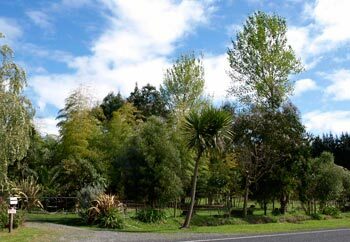 In 2007 all the pine trees that used to grow along the eastern (road) boundary were felled, liberating the native trees that were planted in between them, as you can see in the view from the road in the first photograph on the left, below. View of Sector NE-2 from road. 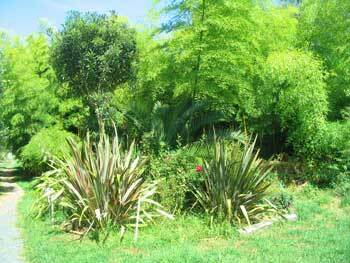 Like many parts of the garden, this small area contains a variety of native and exotic trees and plants. 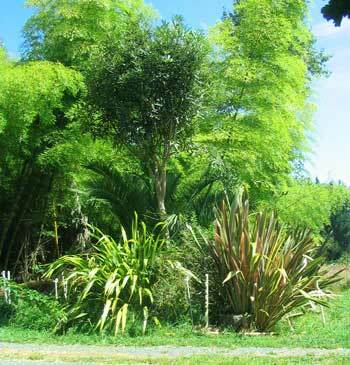 The native plants include the juvenile and adult stages of the horoeka (Pseudopanax crassifolius, lancewood -- the adult horoeka with its slender trunk and rounded top is clearly visible in most of the photographs), variegated and typical forms of the two species of harakeke (Phormium tenax, also called whararahi, NZ flax, and P. cookianum, wharariki, mountain flax), two kinds of whara (Astelia solandri - köwharawhara, & A. grandis), along with two species of divaricating Coprosma and also the groundcover Dianella nigra (pëpepe, türutu, piopio, NZ blueberry). Exotic species (apart from the weeds) are the Phoenix palm in the centre, which had been a gift to our son Liam from a friend, two species of rose, one a scrambler with brilliant dark red flowers, the other a very thorny old bush rose, from a cutting from a plant collected by Lady Rose Henare and her sister-in-law Mei Cherrington from the site of the Anglican mission in Te Wahapu in the 1930s. 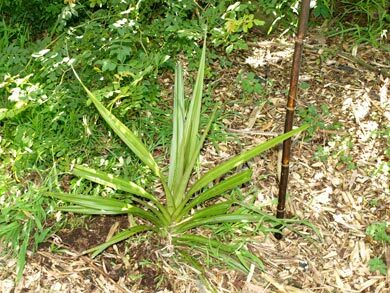 There is also several plants of the native tï (Cordyline spp.) nearby. View from the southwestern edge towards the gate. 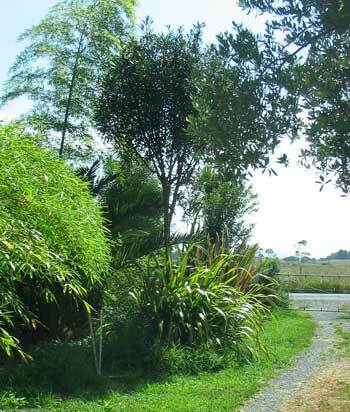 View of the southern edge, from driveway, with horoeka tree in the centre and moso bamboo in the background. 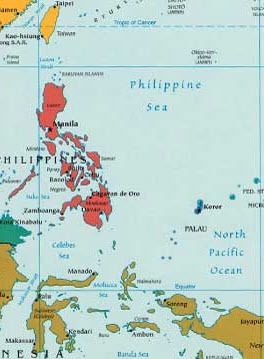 This is the era around the time that groups of Austronesian language speakers were beginning to leave Taiwan and start exploration and settlement of the Philippines, a process that would later see their some of their descendents sail as far as Madagascar in the southwest, Hawaii in the Northeast, Rapanui to the east and Aotearoa in the southeast. At some point those who sailed to the east also almost certainly reached South America, bringing back the kumara and the hue (gourd) to Eastern Polynesia. The map below shows the areas covered by the first stages in this adventure. Both pages have links to other names incorporating the root word whara. 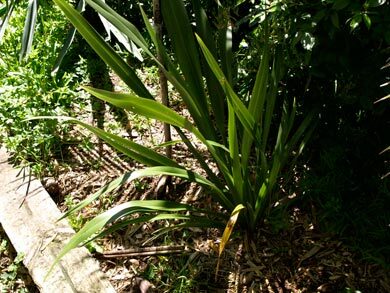 If you are starting from here on the "Time Travel" walk, when you have inspected the plants in the polygonal whara plot, walk down the driveway about 30 metres to the next point (Proto Malayo-Polynesian - dispersal through the Philippines). It's at the corner of the driveway going off to your left, just past where the longest shadow in the next picture goes across the main driveway. 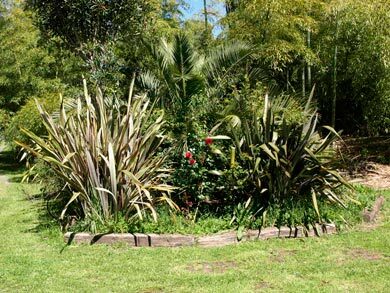 After you have looked at the plants pictured in the column opposite, you can, if you wish, continue your virtual journey through time by clicking on the link below the next photograph..
Phormium tenax, haraheke (right) and an unusually large-leaved variegated form of Phormium cookianum, wharariki (left). 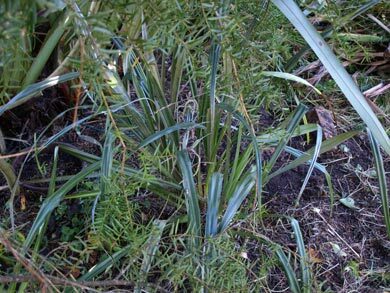 Young plant of typical Phormium cookianum, wharariki. 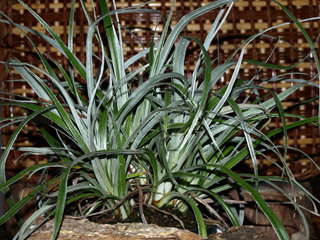 Astelia grandis - one of the plants known collectively as whara.